We report here a rare case of RCC with metastasis to mandible. A 57-year-old man was referred to a dentist with the chief complaint of right mandibular swelling for two weeks. Examination revealed a soft mass (2 cm × 3 cm) in the right molar region. In addition, he had trismus and mobility of the second and third molar teeth. In the panoramic radiography, there was an ill-defined radiolucent lesion in the right molar and ramous region. An incisional biopsy was performed. The pathology report was metastatic renal clear cell carcinoma. Histologic evaluation revealed the presence of a solid nest of epithelial cells with clear cytoplasm and small, round hyperchromatic nuclei [Figure 1] and [Figure 2]. A rich vascular network was also noted. Immunoperoxidase specific antigen and desmin was positive and further supporting the diagnosis, tests were positive for cytokeratin and vimentin but was negative for S-100, HMB-45. The patient was therefore referred to the urologist. 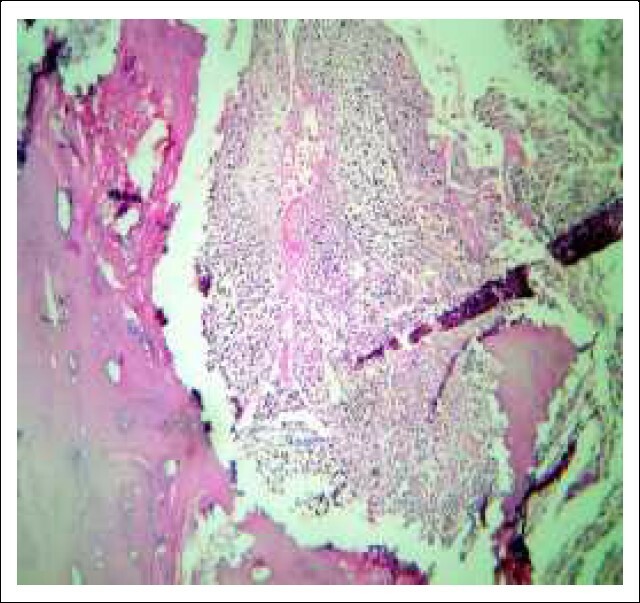 Figure 1: Clear cell carcinoma. The tumor is composed of a solid nest of epithelial cells with clear cytoplasm (40×). Figure 2: Tumor cells near the bony structure (10×). 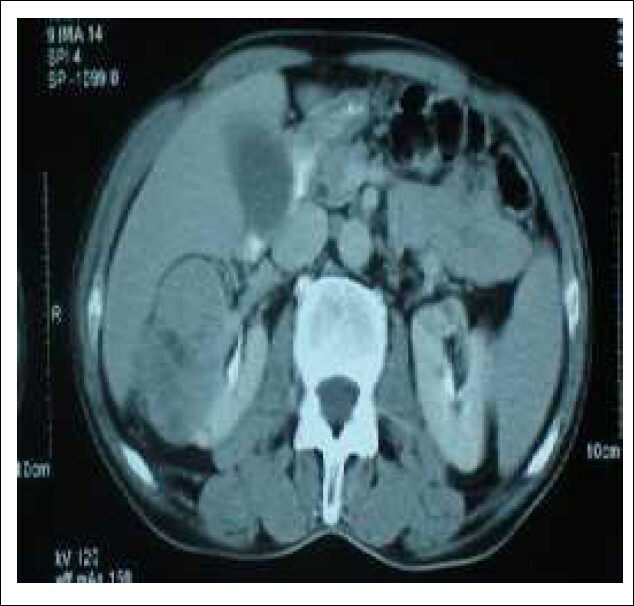 There was no history of gross hematuria, but the patient complained of mild right flank pain. Routine laboratory tests demonstrated anemia, microscopic hematuria, increased erythrocyte sedimentation rate (ESR) and alkaline phosphatase (ALP). Ultrasonography revealed a solid mass in the right kidney. Abdominal computed tomography (CT) scan with and without IV contrast showed a heterogeneous solid mass (5 cm × 7 cm) in the lateral side of the right kidney, which was enhanced with IV contrast [Figure 3]. There was no visceral metastatic lesion. Pre-aortic lymphadenopathy was present. Color Doppler ultrasonography showed no venous involvement. Chest X-ray was normal. In the whole body bone scan, a metastatic lesion in the right mandible was present but no other bony metastatic lesion was reported. Figure 3: Abdominal CT scan with IV contrast showed a heterogeneous solid mass in the lateral side of right kidney. Right radical nephrectomy was performed. The pathology report was clear cell carcinoma (conventional RCC) with Fuhrman grade 3. Histopathology exam confirmed that the resected lymph nodes were metastatic. The mandibular mass was subsequently resected with a safe margin of about 2 cm. The patient was referred to a medical oncologist for further therapeutic options. Most patients die within one year after detection of head and neck metastasis. Therefore, palliative therapies to maximize comfort and minimize morbidity should be the mainstay of the treatment considering the poor long-term prognosis. Excision of RCC metastasis to the mandible was performed to relieve pain and allow the patient to swallow and prevent bleeding and infection. This report emphasizes the importance of the consideration of unusual presentations in any organ such as the maxillofacial region as it may be a sign of either a primary or a metastatic tumor. When metastatic lesion is suspected, a search for the primary site should be immediately initiated and a biopsy for definitive tissue diagnosis should be obtained. In addition, appearance of a new oral or neck lesion in a patient with a history of RCC should include metastatic RCC as part of the differential diagnosis. If metastatic RCC is diagnosed, additional therapeutic options, including radio-therapy immunotherapy and participation in a clinical trial, should be discussed with the patient despite the poor overall prognosis. 1. Flanigan RC, Campbell SC, Clark JI, Picken MM. Metastatic renal cell carcinoma. Curr Treat Options Oncol 2003;4:385-90. 2. 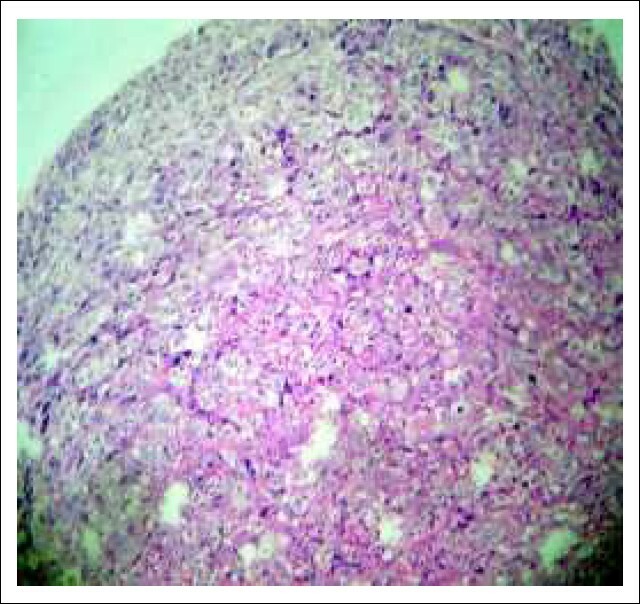 Ahmadnia H, Molaei M, Mansourian E. An uncommon manifestation of renal cell carcinoma: Contralateral spermatic cord metastasis. Central Euro J Urol 2009;62:40-1. 3. Shetty SC, Gupta S, Nagsubramanium S, Hasan S, Cherry G. Mandibular metastasis from renal cell carcinoma. A case report. Indian J Dent Res 2001;12:77-80. 4. Sastre J, Naval L, Muñoz M, Gamallo C, Diaz FJ. Metastatic renal cell carcinoma to the mandible. Otolaryngol Head Neck Surg 2005; 132:663-4. 5. Eversole LR. On the differential diagnosis of clear cell tumors of the head and neck. Oral Oncol Eur J Cancer 1993;29B:173-9. 6. Maiorano E, Altini M, Favia G. Clear cell tumors of the salivary glands, jaws, and oral mucosa. Semin Diagn Pathol 1997;14:203-12. 7. Will TA, Agarwal N, Petruzzelli GJ. Oral cavity metastasis of renal cell carcinoma: A case report. J Med Case Rep 2008,2:313. 8. Ebert CS Jr, Dubin MG, Hart CF, Chalian AA, Shockley WW. Clear cell odontogenic carcinoma: A comprehensive analysis of treatment strategies. Head Neck 2005;27:536-42.